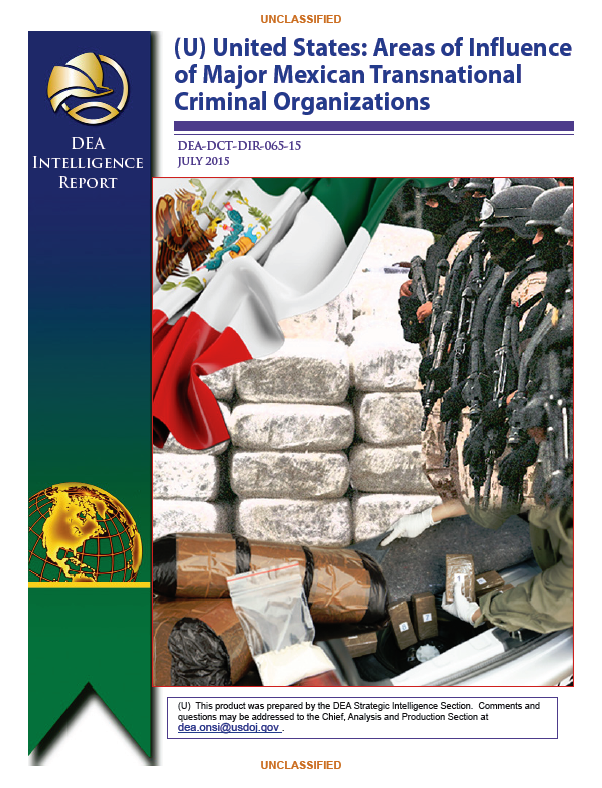 (U) Mexican transnational criminal organizations (TCOs) pose the greatest criminal drug threat to the United States; no other group is currently positioned to challenge them. These Mexican poly-drug organizations traffic heroin, methamphetamine, cocaine, and marijuana throughout the United States, using established transportation routes and distribution networks. They control drug trafficking across the Southwest Border and are moving to expand their share, particularly in the heroin and methamphetamine markets. 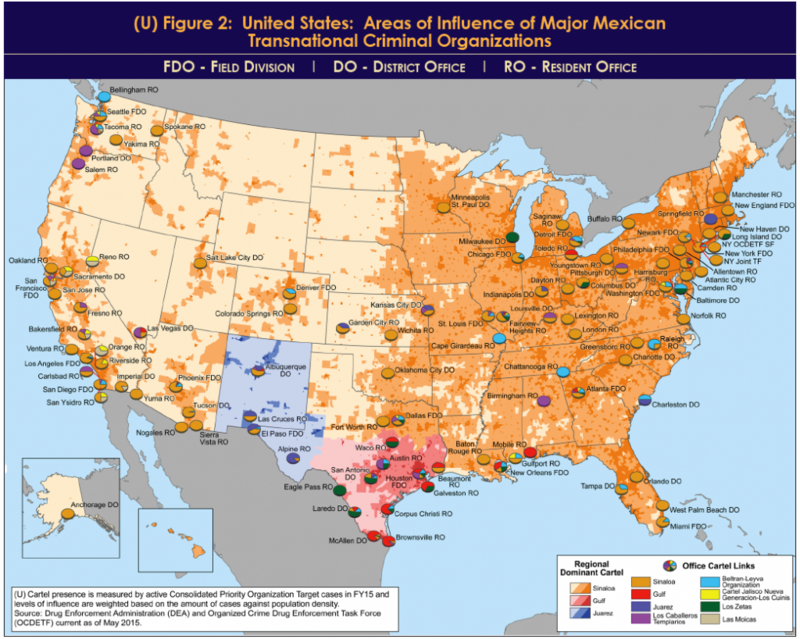 (U) These maps reflect data from the Organized Crime Drug Enforcement Task Force (OCDETF) Consolidated Priority Organization Target (CPOT) program to depict the areas of influence in the United States for major Mexican cartels (see Figure 1). A review of Drug Enforcement Administration (DEA) information on Mexican CPOTs as of May 2015, identified the following cartels that operate cells within the United States: the Sinaloa Cartel, Gulf Cartel, Juarez Cartel, Knights Templar (Los Caballeros Templarios or LCT), Beltran-Leyva Organization (BLO), Jalisco New Generation Cartel (Cartel Jalisco Nueva Generacion or CJNG), Los Zetas, and Las Moicas. The pie charts seen on the maps show the percentage of cases attributed to specific Mexican cartels in an individual DEA office area of responsibility. (U) Since 2014, the Arellano-Felix Organization, LCT, and the Michoacán Family (La Familia Michoacán LFM) cartels have been severely disrupted, which subsequently led to the development of splinter groups, such as, “La Empresa Nueva” (New Business) and “Cartel Independiente de Michoacan” (Independent Cartel of Michoacan) representing the remnants of these organizations. In those areas of the United States still linked to the former LCT organization, illicit drugs continue to be sourced to organizations from the Michoacán, Mexico area. (U) In Figure 2, an additional layer of color shading was added to depict the dominant TCO in each domestic DEA Field Division (FD), relative to other active TCOs in the same geographic territory. The shading also displays general U.S. population density and is not indicative of quantifying the number of TCO members in various parts of the United States. Instead, the population density shading is intended to depict potential high density drug markets that TCOs will look to exploit through the street-level drug distribution activities of urban organized crime groups/street gangs. (U) As indicated in Figure 2, the Sinaloa Cartel maintains the most significant presence in the United States. They are the dominant TCO along the West Coast, through the Midwest, and into the Northeast. While CJNG’s presence appears limited to the West Coast, it is a cartel of significant concern, as it is quickly becoming one of the most powerful organizations in Mexico, and DEA projects its presence to grow in the United States over the next year. In contrast, Mexican cartels such as the Gulf, Juarez, and Los Zetas hold more significant influence closer to the Southwest Border, but as shown on the map, their operational capacity decreases with distance from the border. As mentioned above, splinter groups from the disrupted LCT organization continue to traffic drugs from the Michoacán, Mexico area into the United States. The BLO, former transportation experts for the Sinaloa Cartel, is most active along the East Coast and is also responsible for the majority of heroin in the DEA Denver FD area of responsibility. Las Moicas is Michoacán-based organization with former LFM links, but remains a regional supplier in California and operate on a smaller scale relative to other major Mexican TCOs. (U) The shading found on the last map (Figure 3) is representative of 2013 heroin overdose death data from the National Center for Health Statistics/Centers for Disease Control (NCHS / CDC). According to DEA’s 2015 National Heroin Threat Assessment (NHTA) Summary, heroin is available in larger quantities, used by a larger number of people, and is causing an increasing number of overdose deaths than previous years. In 2013, 8,257 Americans died from heroin-related overdoses; nearly triple the number in 2010. Increased demand for, and use of, heroin is being driven by both increasing availability of heroin in the U.S. market and by some controlled prescription drug abusers using heroin. (U) According to the 2015 NHTA Summary, Mexican traffickers are expanding their operations to gain a larger share of eastern U.S. heroin markets. The heroin market in the United States has been historically divided along the Mississippi River, with western markets using Mexican black tar and brown powder heroin, and eastern markets using white powder (previously Southeast and Southwest Asian, but over the past two decades almost exclusively South American) heroin. By trafficking South American heroin and increasing production of white powder heroin in Mexico, Mexican DTOs have been able to enter the lucrative white powder heroin markets in the Midwest and Northeast. Mexican organizations are now the most prominent wholesale-level heroin traffickers in the DEA Chicago, New Jersey, Philadelphia, and Washington FD areas of responsibility, and have greatly expanded their presence in the New York City area.